Starring alongside the iconic Harvey Fierstein in the Public Theater’s Gently Down the Stream, Gabriel Ebert Rufus, a young British man who falls in love with an older American gentleman. Their relationship is chronicled over the span of 13 years, where both characters undergo changes. Ebert is no stranger to the Broadway stage, having acted alongside Keira Knightley in Thérèse Raquin last year and originated the role of Mr. Wormwood in Matilda in New York. He talks with Paste about his new role, working with Fierstein and generational gaps. Ebert first met the iconic theatre actor when he was working on Casa Valentina. From there, the Fierstein asked Ebert to read for the part of Rufus, and the rest is history. Paste: For readers who don’t what the play Gently Down the Stream is about, could you explain it to them? 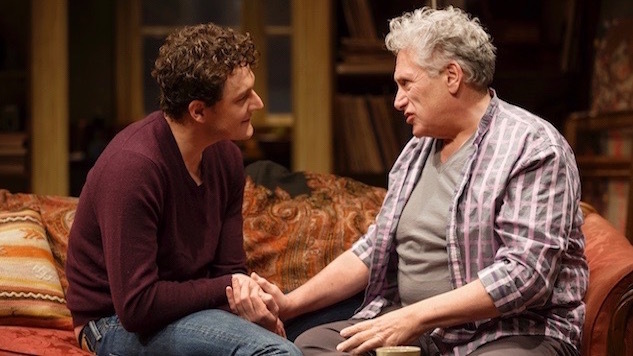 Gabriel Ebert: I would say Gently Down the Stream is a play about a relationship between an older American and a younger Englishman that spans the course of about a decade, dealing with issues of generational misunderstanding, unwritten gay history and ultimately, love. Paste: At the beginning, Rufus is very energetic and focused on the past. Could you talk a little bit about his obsession with the past? I do think it’s a generational misunderstanding that some of the things we have today are taken for granted. Even if we look back at them and think ‘Oh, it must have been great to be part of that struggle, we don’t really see the underbelly of what the cost was. I think Beau really represents what the cost is, and played by Harvey Fierstein, who lived through a lot of these events and was a key figure and an iconic theatrical spirit within it all, hearing that language come out of his mouth is doubly potent. Paste: You’ve worked with a lot of amazing actors. What’s one of the biggest lessons you’ve taken away from working with them? Ebert: The main lesson is don’t try and repeat what you did last night, because you can’t. It’s a trap that you have to learn every single play. If you’re holding on to something from the night before, you inevitability sabotage your opportunity to find something new the next night. It’s a lesson you have to learn over and over again. Different actors face it in different ways. I feel like that’s sort of a cliche, but that’s the inevitable one you come against all the time. Working with Harvey is so great because we’re both spontaneous people. We’re both pretty rigorous about authenticity. Harvey also just makes sure that we have a good time. He’s a wild man. We’re always laughing backstage and even on-stage. Paste: I’ve noticed you’ve been in some movies. Are you planning to do any more of those in the future or are you going to try to stick to the stage? Ebert: I definitely would love to be in more films. I think at this particular time in our business the only way to make a real living is to walk in both worlds. I do film. I love certain actors that I feel are able to do really great work on film. I hope that I will be able to have those opportunities and put myself in those positions to do good work in film as well. I’m still figuring out how to do it, because I sort of grew up on stage. My learning of how to act in films has all happened on the job. I feel like I still have miles to go before I sleep. Because I’m a stage-man, I like the feedback and having the audience there. I enjoy the repetition of doing it every night and showing up and trying to tell the story. I get a little lost in the camera world, because it’s kind of piecemeal. You do things out of order and you do the same thing over and over but with different takes. It’s just a different muscle and I just need to learn how to do that. Paste: Aside from as your role as Rufus, because otherwise I think you’d say it’s been one of your favorite roles.. What’s been your favorite role to play on-stage in your career? Ebert: I guess I would say Rufus, because you always want to enjoy the one you’re doing the most. Oh wow… I’ve been a lucky boy. I’ve gotten to play some great roles. I have a friend who has a house upstate New York. Every summer he likes to get a small troop of actors together and do a Chekhov play. We just rehearse it for a week and we perform it once. The audience comes and sits on the lawn of his house, and we do the play. We rehearse for the week, so we kind of have a plan. One year we got to do The Seagull, which is a play by Anton Chekhov that I deeply love. I got to play Konstantin, which is a role that I deeply love. I swam in the lake and I shaved my head live in the performance. It was a real actor’s dream, because we’re just living up there sleeping in tents for the week. We create this work of art. We do it because we love it and we do it with people that we love, then we perform it one time and give it away. There’s something really precious and sacred about that for me.